I was raised in a mainline Protestant church and am very grateful for that. Moreover, I have always been drawn to places of worship and to religious books and ideas. My family lived in Austria for a year when I was a child and I am told that I would walk to the front of the European churches that we visited to gaze up at the altar. In Rome I was intrigued by the ancient ruins and the Christian catacombs. When I was older, while working in northern New Mexico, I was drawn to the indigenous Roman Catholicism of the high desert country. I can also recall one summer atternoon, while working in Colorado with the Forest Service, walking through the woods and thinking that perhaps I should enter the ministry, although I am not sure where this notion came from. That led to a brief stint in a Protestant seminary. However, being much too immature, I withdrew after one year. By my late-20's I had lost my spiritual moorings. I knew that something was missing from my life but I was not even sure what I was looking for. Things were complicated by a loss in my childhood and by other early challenges, things which made me distrustful of happiness and relationships, and which left me with an angry, defensive attitude toward God and Christianity. Unfortunately, the church of my youth was no longer a refuge. Increasingly, Protestantism seemed to have been co-opted by the modern culture, spiritually dead and theologically empty, at times more like a kind of social club or self-righteous political activism than faith. Like many young people, I flirted with Eastern religions, but I also understood on some level that these offered only an empty, nihilistic and self-absorbed experience of reality, and that I could not walk away from the church of Christ (even though I was not at all sure that He wanted anything to do with me). But where was that church? And was there a place for me within it? Something always seemed to be blocking my path. Was it my own emotional immaturity, stubborn pride and lack of faith? Was this God's way of telling me that I was on the wrong path? Moreover, having been brought up with a "Western" mindset, it seemed as if the modern Christian was faced with a terrible, impossible choice. I could put on intellectual blinders and approach the Scriptures like a "fundamentalist", with lots of emotion and doing my best to ignore the world of the mind, I could try to adopt the barren "post-modern" and "de-mythologized" faith of many of my peers, or I could abandon Christianity altogether. The first choice was impossible for me and the second and third would have left me with a life devoid of hope or meaning. Then I encountered the Orthodox Church. People have asked me how I found Orthodoxy. Truly, I have no real idea what brought me to the front steps of Holy Cross Church in Williamsport that first Sunday. I can only believe that it was the work of the Holy Spirit taking pity on a lost soul. The friendliness of the Holy Cross community and the beauty of the Liturgy drew me in. Then, in the Orthodox Church, I discovered Holy Tradition and a new and profoundly different way of reading the Scriptures and understanding Christ's work in Creation. Within Orthodoxy there is room for the life of the mind and for the heart, for the intellectual and for mystery -- a mystery very different from anything I'd encountered before. Moreover, the Orthodox Church is a church built on a firm foundation and with a direct link to the ancient church of the Apostles. In spite of my own stiff neck and stubborn kicking at the goads, I did finally join the Orthodox Church (taking the name Anthony) at the age of 54, thank God. I was raised as a non-denominational Evangelical Protestant in southern Pennsylvania. We were pretty conservative morally, and theologically in some ways -- we believed firmly in the Trinity, the Virgin birth, that Christ is God, that Christ is sinless, etc -- but we did not believe in liturgical worship, the sacraments, the Saints, etc. For us, salvation was "Once Saved, Always Saved;" I was saved forever, no matter what, because I had placed my faith in Christ as a child. I always believed in absolute truth (relative truth is an absurdity and this was always obvious to me) therefore I always believed that my particular brand of Christianity was the only true one. I remember arguing with some Catholic friends in middle schoo, telling them they were not Christians because Christians follow the Bible and the Catholics certainly don't! This is not something I hold to now as an Orthodox Christian, but nevertheless, such were my beliefs before becoming Orthodox. We were quite active in our church -- went to services three times a week -- and at various points in my life I would read the Bible daily. I never once doubted the truth of Christ. Towards the end of high school and into the beginning of college I got into the partying scene, although, thank God I never got too crazy. When I got to Penn State (and didn't have my parents to make me go to church) I stopped going, although I never stopped believing in Christ. However, my life did not line up with this faith. I specifically remember one time when I was hanging out and drinking with several agnostic/atheistic friends. I was trying to convince them that homosexuality is a sin, and they pointed out to me that the Bible also says that getting drunk is a sin. I said "yes, but I'm saved, so its ok." I really thought this was some great line and that I had really "got" them. Looking back, this was, of course, completely ridiculous of me to think and say. In the fall of my junior year when I was 20, I went to a Lynyrd Skynyrd concert with several friends. We ended up getting arrested because my friends were using an illegal substance. I was taken out of the concert with them and while being questioned the police smelled alcohol on my breath. I had already been charged with underage drinking in high school and had gotten in trouble with Penn State in my freshman year for drinking in the dorms. I was pretty sick of getting in trouble -- it's expensive to keep getting citations! And more importantly, my conscience was beginning to nag at me and I was ashamed of letting my parents down who had raised me properly in the Christian faith. So I decided to stop partying, and while I was at it I decided to go back to church. By this time, I had encountered Gary Cattell, the "Willard Preacher." He is a well known street preacher on Penn State's campus who preaches outside the Willard Building (hence the name). He has been preaching on campus for over 30 years, and about 15 years ago he converted to Orthodoxy from Protestantism. At this point I knew nothing about Orthodoxy and I simply assumed Gary was the pastor of some Protestant church known as "Orthodox." So I went to nearby Holy Trinity Orthodox Church one Sunday, and boy was I shocked! Gary had nothing to do with the service, and as far as I could tell this was just some weird form of Catholicism! I hated it and told myself I'd never go there again! So I found a Baptist church online and I stated going there, where many other students attended. I also started going to several Protestant youth groups on campus. I was going to a different group almost every night of the week. Fast forward to the Spring of that school year. I was listening to the Willard Preacher every day, and one day I remember hearing him speak about why he left Protestantism and embraced Orthodoxy. Somehow I had managed to listen to him for quite a while before finding out that he had once been a Protestant. Years before, a Catholic and Orthodox student confronted him about some things he was saying and they asked him to prove Sola Scriptura -- that the Bible is the sole authority in Christianity. Gary spent the weekend looking through the Scriptures and found out that the Bible never clalms to be the sole authority, but that it is profitable for salvation, whereas the Scriptures proclaim the Church to be the pillar and ground of truth. This eventually led to him entering that Church -- the holy Orthodox Church. As he spoke about the problem of Sola Scriptura and other problems with Protestantism I became intrigued. Everything he said made perfect sense to me. I never thought about these things before. I was a bit of a unique case at Willard in that I knew almost right away that I would have to become Orthodox. I have seen many others convert who took years to finally come around and who wept and struggled hard, but everything fell into place for me. Suddenly all those things I rejected from my childhood faith -- liturgy, sacraments, Saints, etc -- all made perfect sense. I started regularly attending Holy Trinity and the Orthodox Christian Fellowship on campus where I made many good friends. The first service I went to this second time was in Lent and it must have been a Presanctified Liturgy (I remember thinking how cool it was that you could come out of Church sweating!). I went to many more services in the end of that semester, including Pascha which was the most amazing thing I'd ever seen. I went home that summer and attended the local Orthodox Church several times, and when I returned to school in the fall of my senior year, I was enrolled as a catechumen in the first few weeks of the semester. In the ensuing weeks many other students became catechumens thanks in part to the influence of the Willard Preacher. I was very active in the parish and the OCF. We had Church-related events every day of the week except Fridays and we went on many retreats hosted by other OCF's and to various monasteries. I loved everything about the Church. I was baptized that school year -- on Holy Saturday, 2006 -- and it was undoubtedly the greatest moment of my life! Conversion, though, is not a one-time event. It is ongoing throughout the remainder of our lives. My own conversion was mainly intellectual -- the doctrines and history of the Church all made sense and opened up an incredible depth of faith and praxis. I had not had any profound experience in an Orthodox Church and never been moved to tears by a service (as did some of my friends). I had, and still have, absolutely no doubts about the truth of the Orthodox faith. But my conversion is continuing in the struggle to bring my faith from my head into my heart. An absolutely essential element of this process for me has been the person and writings of Fr. Seraphim Rose who taught me to value love and humility and obedience over always being "correct." Fr. Seraphim is an American convert to Orthodoxy who became a monk and priest and a well-known author. He reposed in 1982, and many consider him to be a Saint, as do I.
I had converted to Orthodoxy because it is the truth, but soon after I converted I found out about the Old Calendarist groups who proclaim that they have preserved the truth even more fully than had the historic Orthodox Churches which they believed had compromised too much with the world. I was quite interested in these various groups for quite awhile -- they appealed to my desire for truth. But the biogrgphy and letters of Fr. Seraphim Rose which detail his dealings with such right-wing zealots helped me to see the errors of judging without love and schisming from the Orthodox Church, which these "True" Orthodox churches had one. Fr. Seraphim taught me that although the truth is of utmost importance, an essential element of that truth is to have a humble and loving heart which refrains from judging others. By his guidance and prayers and that of all the Saints, I continue to struggle to develop a truly Orthodox heart such as he had. In 2010, I entered the Masters of Divinity program at St. Tikhon's Seminary. "South Tenessee to South Canaan"
I was born of Methodist and Baptist parents in the mid 1960s. I was born in Knoxville, Tennessee, but grew up in Jackson, Tennessee, near Memphis. I was christened in the Methodist Church at birth. I have the distinct honor of being the only person, to my knowledge, to have failed confirmation class. When I first went through confirmation class, around age 11, my father who was the Baptist half of my upbringing, wanted to make sure I knew that the decision to be received in the Church was my decision, but that I should be prepared to keep that decision for the remainder of my life. It was his way of stressing the individual nature of the decision to accept Christ. I chose to decline the confirmation. The following year I was received into the Methodist Church. I had the option of being rebaptized, and I chose that option, again being influenced by my father. I was baptized through the pouring of water on my head. The following year my mom and dad decided they could best serve Christ in the Baptist Church. We all went along, and together with my mother I was baptized by immersion, marking my third baptism. Hopefully one of them "took". In my early teens I felt a calling toward full-time Church work. I preached my first sermon at age 15 in a Baptist Church on a lay leadership Sunday. It was a miserable, but cute, failure. I started college at Middle Tennessee State University after working at an AM Radio station in my hometown, and aspiring to be a recording engineer. During my freshman year, I learned that the best recording engineers made below the poverty level. I quickly determined I needed a new career. I had a friend who was in his third year of Harvard Law School, and spoke about his interviews for clerk positions. I was enthralled. I wrote to a family friend who was a circuit court judge and corporate lawyer, and sought his advice. He advised taking all the accounting I could, which I did. During college, I stopped attending Church. The Baptist Church was in the midst of a split between conservatives and moderates; a split that was quite nasty. I never lost faith but I did lose the connection with Church. After graduating from college, I was tired of being poor and in school, so I accepted a job offer and began my career instead of pursuing law school. I got married to my high school sweetheart in 1987, and took a job transfer to the small East Tennessee mountain town of Kingsport in 1989. Our daughter was born in 1991. Later that year, I was transferred to Fort Lauderdale, Florida. My wife and I began suffering culture shock. In order to alleviate the shock, we decided to seek out the only familiar thing we knew in south Florida and joined a small Baptist mission Church. We enjoyed the experience, however I began to yearn for a more reverent, worshipful experience. I began searching for what I would later learn was called "liturgical" worship. I was also seeking to find out what needed to happen after the salvation experience in the Baptist church. They offered no framework for growth, nor was growth particularly emphasized. My brother had lost his hearing in the navy, and we utilized a computer-based communications tool to keep in touch. This computer system also had discussion roundtables and I joined the Religion and Philosophy roundtable in order to investigate different faiths. I was particularly interested in the way faith was practiced at the personal level, as opposed to doctrinal or "official" levels. I could not reconcile with the monarchial model of the Catholic church, and both the Episcopal and Lutheran Churches were going through splits similar to the ones that chased me from the Baptist Church. However, there was a group of four people who made up the Eastern Orthodox roundtable. They patiently entertained my questions, and were gentle in helping guide me in the way they saw the relationship between faith and life. I had my first experience with Orthodox worship for the feast of the Three Hierarchs, January 30, 1994. I was blessed to find a group of former evangelicals who had converted some years before. They were able to help me grow toward the faith, as it was a path they has also begun to tread. My wife, daughter and I were received by chrismation into the Orthodox Faith in October, 1995 after being catechumens for 18 months, at St. John the Evangelist (Antiochian) Church in Memphis, Tennessee. Soon after the birth of our son Jonathan, we moved to Dayton, Ohio and joined St Paul the Apostle parish (OCA). After completing the Diaconal Vocations program offered by the Columbus Deanery in 2007, I was ordained to the Diaconate at St Paul Church in Dayton by Archbishop Job of blessed memory in October, 2008. During this time, I was a healthcare consultant and executive, spending time flying around the country. Typically I'd leave on Sunday evening and return home Friday evening. I really began to miss my family, and looked for opportunities for us to be together. In early 2010, after six years of traveling, I left my career as a healthcare exectuve and began to pursue the Masters of Divinity degree and possible priesthood at St. Tikhon's Seminary. I chose St Tikhon's because of the richness of the liturgical services as experienced in the monastery church, I have always felt strongly that the Academic preparation can be attained in many locations, but the liturgical formation so necessary to the Christian life is found most fully in the monastic setting. St Tikhon's allows me to pursue both goals. On the feast of the Lord's Transfiguration, 2012, I was ordained to the Holy Priesthood by Archbishop Tikhon in St Tikhon's Monastery Church. From a young age, my parents taught me the importance of two very important realities: two experiences that we lived. These two realities were that of culture and family. I grew up in the Mississippi Delta; the North Western part of the State of Mississippi. It is a very impoverished area but, like many places in the South, it is rich with culture. The Mississippi Delta Blues Festival was literally right down the road from our house. I remember walking down to it, in an open field. The bands were all there playing music and many people came to hear them. It was a real cultural experience, part of the life of the people. As with kindness, being gentle and taking care of others is a part of the culture down there. We helped our neighbors and they helped us. Even though we were from the North -- my father from Chicago area and my mother from Indianapolis, Indiana -- people welcomed us and we welcomed them. They treated us like we belonged there. We were family to them and they were family to us. The reality of family is another thing we lived. We were close knit. Family was important to us. We even travelled back many times to Indianapolis to see our family and relatives -- aunts, uncles, cousins, grandparents. I was raised zealously nominal Roman Catholic. This was part of both family and culture. It was what we did as a family. Everybody in the family was Roman Catholic so we were too. It was a meeting of family and culture for me growing up. Moving ahead to my senior year in High School, we moved to Phoenix. I met my future wife, Veronika, at the Catholic Church youth group. I graduated and got a job. My future wife and I both decided to go to Catholic Universities for our undergraduate degrees. I went to Franciscan University of Steubenville in Ohio and she went to Duquesne University in Pittsburgh. We graduated and moved back to Phoenix. I moved in with my Dad. We got married six months later. My Dad's neighbor was a retired French Chef from France and my Dad asked me if I wanted a job. I said yes and I began working for the Chef, Bernard. He taught me how to cook. (I am now the cook at St. Tikhon's Seminary and cook for all the Seminarians) I worked under the Chef for two years. After my wife and I got married we became catechumens in the Orthodox Church and then were Baptized Orthodox. I had first been exposed to the Orthodox Church at the University. I had a friend who became my mentor; an old gentleman I met there named Todd. He taught me about the Orthodox Church, the Theology of the Orthodox Church, Patristics, St. Gregory Palamas and the Cappadocian Fathers. I had never had any experience with the Orthodox Church. There are Orthodox Churches in Mississippi, but there aren't many and thus not many people know about the Orthodox Church there. I wasn't taught anything about the Orthodox Church growing up. I had a little bit of experience of the Divine Liturgy and Orthodox Spirituality before going to University because I had visited some Byzantine/ Greek Catholic Churches, but it wasn't the fullness of the Orthodox Church. Todd introduced me to the Orthodox Church, but for me it was still just an intellectual knowledge of Orthodoxy, not the fullness. My future wife and I would drive up to a Greek Catholic Church in Northern Ohio while I was at University. I was searching for more. Not to say anything bad about Roman Catholicism, but if I'm honest with myself, I would say I was going to hell as a Roman Catholic, for a lot of reasons. The Orthodox Church -- Christ saved me. I was looking for more, for culture. I was looking for the Orthodox Church, to experience it. Culture is not just something that you do. I was looking to live the Christian culture. We do this as Orthodox Christians. We say our morning prayers and our evening prayers. We have icon corners in our homes. We live out our tradition, our faith. Our Faith is our lived-out Christian culture. We have culture in Christ. The Church is our Family. That's what I was looking for; what I was yearning for. My wife and I were trying to live out Orthodox faith and spirituality without being Orthodox -- so we became Orthodox because we realized you couldn't be Orthodox without being in the Church. The following stories were originally presented as part of a series celebrating the 30th anniversary of Holy Cross Church in 2007; now offered for the benefit of all who may be embarking on similar journeys! May the Lord direct your steps! Our journey to Orthodox Christianity began just prior to our marriage in June 1996 upon meeting Meg's sister's new boyfriend, John Oliver. John had a transformative experience at the Valaam Monastery two years earlier (documented in his book Touching Heaven) and had recently converted to Orthodoxy. John was faithfully and diligently working out his new faith in America and was contemplating pursuing the priesthood. We immediately clicked, and spent several late nights discussing many subjects, including the Church. The evening before we departed, John and I locked horns in a friendly but spirited discussion about the Bible, Church history and the legitimacy of the Protestant doctrine of sola scriptura. Toward the end of our debate, John punctuated his thoughts (and mine) with; "Dylan, I am certain that if you continue to seek the Truth, you will embrace Orthodoxy." His brief statement initially struck me like a presumptuous punch to the chest and it somewhat sobered our new relationship. But he had already earned enough of my respect for me to accept his comment as a signpost on my journey of faith. Unknown to Meg and me, it marked the beginning of our journey to Orthodoxy. 1998-2003: Turbulence in the "PrimitiveChurch"
The year before and following our marriage, Meg and I searched sincerely for a church we could call home. We attended several churches, but none fulfilled our two basic needs of a congregation's loyalty to conservative Biblical doctrine and that it view and conduct itself as a tightly knit family. Further, having been exposed to Orthodoxy and knowing enough church history to question the validity of sola scriptura, we were now beginning to develop a third test for evaluating sound church doctrine: the body's acknowledgement of Holy Tradition as a legitimate and necessary revelation in addition to, and inseparable, from Biblical revelation. Mainline Protestant denominations had long been ruled out given their subscription to an alarmingly liberalizing theology. We settled on meeting with several Christian families in a local house church. Our house church was the center of our spiritual life for nearly five years. It was an earnestly God-seeking, Bible-loving body and it fully met our first two criteria for what we believe the Church is and should strive to be. Some of our closest friends are still in theBlacksburg house church. However, as our exposure to Orthodoxy grew, through our relationship with the Olivers, reading and occasional attendance at Orthodox churches, we began to recognize some key structural and foundational fallacies in the house-church theology as well. Most notable was the disdain for the "traditions of men," which is house-church shorthand for the set of misinterpretations and innovations of the organized church resulting in liberalized theology and departure from Biblical teachings. To this degree the house church movement is enlightened. However, in practice, their rejection of tradition is a zealous but equally unsophisticated disregard for all church tradition; unsophisticated given the house-church movement's unwitting reliance on Holy Tradition which for two millennia has defended Holy Scripture against every heresy thrown at the Church from the gates of hell. Holy Tradition, largely unknown and consequently unacknowledged by Protestantism and the house-church movement, is nonetheless a necessary pillar of Revelation upon which these churches subsist. The house churches' response to the erosion of sound Christian doctrine within Protestantism has been to resurrect the "primitive Church." Rooted in sola scriptura, house-church theology is cobbled together through "prescriptive evidence" gleaned from the New Testament. However, this very action of church resurrection contradicts Christ's own words in Matthew 16:18 that the gates of hell would never prevail against His body, His church. If Christ meant "never means never," then where was the true church today? And no matter how sincere our intention, what justification did our house church, disconnected from Christ's ever-living body, have for attempting to recreate His church? Further, as with the rest of the Western church, in rejecting all tradition including Holy Tradition, the house-church movement ironically developed its own tradition, in part by venerating and singing the hymns of their own set of Western saints: Luther, Zwingli, Wesley, Moody. Yet, like many Protestant churches, these same house-church congregations look askance at icons and are either completely ignorant or profoundly arrogant in rejecting twenty centuries of Church saints who, in unyielding continuity, defended and died for the Church from Pentecost to this day. The theological and doctrinal contradictions were increasingly undeniable, but because we were a very close community of friends and committed to practicing Biblical truth, we continued to meet with the house church. In 2004, we moved to Williamsport, PA because we desired full exposure to the Orthodox church and a sound foundation upon which to either accept or reject it. We couldn't learn all we needed to know about Orthodoxy by reading books; to fully understand Orthodoxy we had to immerse ourselves in Orthodox life and practice. Although we were not yet Orthodox, we knew enough to believe that we may become so and regularly attended Holy Cross for about 18 months. Meg and I recognized that pledging allegiance to Orthodoxy was equal in commitment to marriage. Having spent 34 years in several Protestant and non-denominational churches including five years in the house-church movement, we were still unsure of our ability to commit to Orthodoxy. We needed to view Orthodoxy one more time from the outside to know for certain that Orthodox practice was superior to the alternatives with which we were more familiar. We took a somewhat restless "break" from Orthodoxy and attended a non-denominational church for about a year. 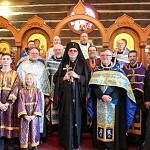 This church was asking many questions to which Orthodoxy had the answers, and we could see that it was repeating the same set of errors that all churches disconnected from Holy Tradition are destined to repeat. While there, I served on the pastor search committee as the "new guy," providing guidance in that search according to the churchs' recently-adopted statement of faith and bylaws. During that time I occasionally mentioned the Orthodox faith and the church elders approached me about incorporating some Orthodox practices into their own. At that point we recognized that unlike Protestantism, true and whole Christian practice is exactly that -- true and whole -- it is not a holy refrigerator where an individual, congregation, or denomination can select the ingredients that best suit today's appetite and are free to choose new ingredients for a different appetite tomorrow. Meg and I practice our faith imperfectly, but we are not Sunday Christians. We immersed ourselves in every church we attended and we understood the theology to which these churches subscribed. All of these churches were composed of good folks who had a genuine desire to know God and His will for guiding their lives. But like most Protestant churches, our interim church suffered from a recurring structural deficiency in foundational theology: adherence to the doctrine of sola scriptura. This doctrine asserts that self-interpreted Biblical revelation is sufficient for knowing and following God's will in all matters. Adherents to sola scriptura will quickly note that it is not the created conscience, but the indwelling of the Holy Spirit that allows full and right interpretation of Holy Scripture. However, the Holy Spirit does not contradict Himself -- so why so many individual Protestants and Protestant denominations with irreconcilable interpretations of basic theological truths? The answer we came to realize is that the Western church either lacks the Holy Spirit, Holy Tradition, or both. Certainly, in some significant ways, the Western church holds to components of Orthodox teaching. However, what truth is found in Protestantism can rightly be viewed as "artifacts of Orthodoxy" that survived the Great Schism, but are increasingly muffled in a mangled theology disconnected from the Holy Tradition which steadfastly guards and defends Truth in its wholeness. In continuing to distance itself from or outright rejection of Tradition, the Western church flirts with the gates of hell. Our experience in the Protestant church instilled in us a deep respect for Holy Scripture and the search for true faith and Christian practice. But everything about our last experience with the Protestant church made Meg and I run unambiguously back to Orthodoxy, this time ready to make it our home. On April 14, 2007, Meg and I and our children Boone and Molly committed ourselves to the Orthodox faith. I am proud to note that our new son Samuel is the first Jenkins to be born into Orthodoxy. With the Orthodox Church as our spiritual home, we have a new-found peace. While we still have much to learn about our faith, there is great relief in knowing that our search for the true Church is complete, a sense of being home and not having to question where we belong or what stance to take on foundational theology and doctrine. As Protestants, we questioned and sometimes defended inconsistent doctrines, trying to rectify an amalgam of beliefs inherited from the dishearteningly-fragmented Protestant church and attempting to decipher Truth solely through Bible study and commentary. As Orthodox Christians, we have gratefully inherited the fullness of God's revelation to mankind: Jesus Christ, the Holy Spirit, Holy Scripture, and Holy Tradition. We now have great comfort knowing that our faith and our practice, like Christ, is "the same yesterday, today and forever." Jaroslav Pelikan, renowned Yale professor of history and religion, converted to Orthodoxy in the latter years of his life. Dr Pelikan described his lifelong journey to Orthodoxy as "circling the airport;" a description that fits our own experience -- initial discovery, constant questioning, learning, circling, and finally safely landing upon our conversion. While our flight lasted a decade, we are gratefu that we landed relatively early in our lives and, God-willing, have the better part of our lifetimes to experience the Church in its fulness. As Fr Oliver confidently counseled ten years earlier, an earnest search for the Truth indeed leads one to embrace Orthodoxy. We thank God for bringing us home. Glory to Jesus Christ! I'd like to start by quoting St. Paul, "Therefore brethren, stand fast and hold the traditions by which you were taught, whether by word or our epistle" (2 Thessalonians 2:15). Chris and I weren't really familiar with this scripture when we began our journey to Orthodoxy, but we've since found it to be not only well-preserved, but steadfastly defended, in the Orthodox Church today. I met my wife Chris in 1999 and, after about three and a half years of dating, I finally worked up enough nerve to propose to her. This was also about the time that we began our journey to Orthodoxy. Chris had been raised in the Roman Catholic Church and I grew up in the Episcopal Church. Neither of us had been recently active in our respective churches but, with marriage looming in our near future, we began to re-evaluate our spiritual lives. We agreed that we needed to get God back into our lives and we needed to get back to church. But which church? The more Chris and I talked seriously about our faith and what we believed in, the more we began to feel uncomfortable with the changes and the directions that both the Roman Catholic and Episcopal churches were taking. I always heard that change is inevitable and in many cases a good thing. However, when it comes to faith, God and the Church, such changes, in our minds, just were not ringing true. So we began to search. If I my digress for a moment... My mother and father had left the Episcopal church -- or as they like to put it, the Episcopal church left them -- some years earlier. They also had gone through a period of searching and questioning before finding and embracing the Orthodox faith. Over the years and since their conversion to Orthodoxy, my parents and I had numerous intense discussions about the Orthodox faith and how they believed it to be the one, true apostolic faith. I was skeptical and resisted their invitations to visit Holy Cross. I suppose in retrospect, this was when the seed was planted in me. I had just refused to let it grow! Back to our search... Chris and I visited many different local churches and various Christian denominations and met a lot of really nice people with really good intentions. But as we delved into the nuts and bolts of the various faiths, we found the common denominator of all of them to be change. They all seemed to be offering some sort of "new and improved" version of Christianity. We just didn't see the need to re-write or fix Gods word. At this point, Chris and I decided that we needed to look backward instead of forward. Chris's brother had given us a book on world religious denominations. The book featured a denominational timeline that really caught our attention. We traced the timeline back to The Great Schism of 1054, when the Roman Catholic Church and the Orthodox Church split. We were intrigued. It appeared that the Orthodox Church had indeed been there from the beginning -- that is, since the day of Pentecost. It seemed as though my parents were on to something. Had they found the one true Church of Jesus Christ? It was time (finally!) to pay a visit to Holy Cross Orthodox Church. We started attending the Sunday liturgies at Holy Cross and although they seemed, initially, to be rather unfamiliar or foreign to us, we soon began to feel a sense of comfort and peace. We felt enveloped in a deep Christian spirituality; surrounded by the many icons, the incense and the singing of the liturgy. Chris and I were inspired by the reverence and deep respect that the priest and parishioners showed for the Holy Eucharist. We wanted to learn more about this ancient faith! We began attending the adult education classes and reading various books about Orthodoxy. The more we learned about the faith, the more we were convinced that Orthodoxy was what we had been searching for; the one true Catholic and Apostolic Faith; unchanged, steadfast not to the traditions of man, but to the apostolic traditions. Today, Chris and I feel truly blessed as we continue to grow in faith and spirit as members of the Body of Christ here at Holy Cross. 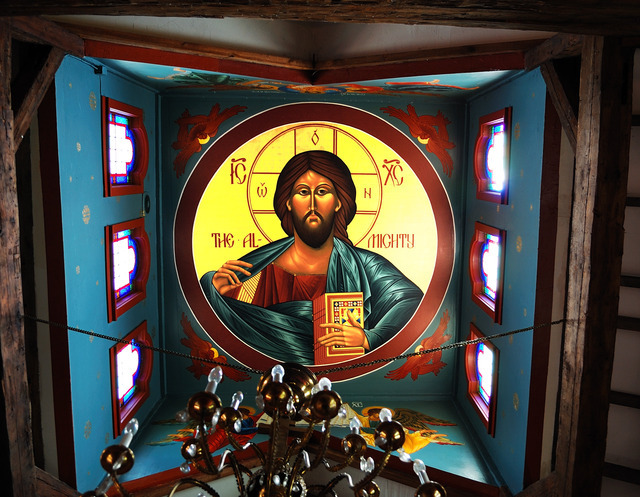 If you too are searching or if your church has left you, we encourage you to come and join us at Holy Cross and get to know the Orthodox faith. 3) "In Patience, Possess Ye Your Souls"
My mother was of New England Puritan background with deep family roots in Chicago (her grandfather actually was at the convention there that nominated Abraham Lincoln). My dad's family was a mix of Irish Catholic and Norwegian Lutheran background (a step-uncle of mine is chancellor of a Roman Catholic diocese in the South, a cousin of my dad's was a Roman Catholic bishop in the Midwest). Like many Norwegians, my dad's family even traced back to early Christian kings of Norway -- who were Orthodox too as Christians in the North before the Great Schism -- but that was, of course, a long time ago. And I basically grew up Unitarian, without knowing any Christian doctrine. It was when I was a teenager that my sister was stricken with what became a fatal illness, and, in secret, I began reading the Bible and praying. Members of my mother's family were Christian Scientists, and I began attending the neighborhood Christian Science church, built like a classical Greek temple. For a number of years I was a Christian Scientist, not taking medicine but relying solely on prayer. Despite living among some very kind people in that community, various experiences ultimately led me to leave, including concerns that the church's organization was too much like a cult; that it lacked true liturgical and Trinitarian traditions; and that its doctrine of Christian healing was rather "gnostic." During many falls along my path, I attended Norwegian Lutheran and Episcopal churches, but was indeed blessed to have a most memorable experience in visiting a Russian Orthodox cathedral in Chicago. Walking in, I deeply felt the beauty of it, like a fabulous Faberge Easter egg; the incense and the physical involvement of people in venerating icons, standing, prostrating, chanting. In talking with the priest and his wife, I was struck by a sense of grace. Later, I learned that priest, Father Sergei Garklavs, was the humble keeper of the famed Tikhvin icon, attributed to St Luke the evangelist, in its exile. A few years later, when I was in graduate school, I found and visited a local Greek Orthodox Church after becoming interested in Orthodoxy through studying about the early Church, learning a little of Orthodoxy's "prayer of the heart," and reading Dostoevsky's The Brothers Karamazov. Again, I was drawn to the beauty of the liturgy and to the pious examples of those in its community. I resisted, however, and, for a time, left its fellowship. When I did return, I realized how I had been deeply hungering and thirsting for Christ and His true Church. The priest there suggested that I visit an Orthodox monastery. It is said that the church is the hospital of the soul and a monastery is the intensive care unit. I was blessed to find in that monastery a holy, spiritual father who helped me greatly in my path to Orthodoxy and baptism. Through prayer and ascetic effort with such guidance and despite many ongoing stumbles, I unworthily experienced the life-saving grace of Christianity as being not "a religion" but the kingdom of God and a corresponding way of life, in which is found healing in the fullness of tradition, healing of the person, body and soul, in the return of the mind to the heart and ultimately, through His uncreated energies, to God. I was subsequently blessed with meeting and marrying my wife at the very same Orthodox cathedral in Chicago where I first experienced Orthodoxy, and seeing our children baptized at Holy Cross. The relational aspects of Orthodox worship, doctrine, and practice -- bodily, interpersonally, and cosmically -- are truly awesome. We are blessed in the Church, in our parish and all our relations, to be part of God's family. Recently at Holy Cross's 30th anniversary, St. Tikhon's Seminary offered a book table that included numerous icons. One that specially caught my eye was of 20th-century elders of Mount Athos; saintly men who have passed to their reward but still pray for the Church family. One, Elder Joseph the Hesychast, is actually the spiritual grandfather of the priest who helped guide me to Orthodoxy. Another's teachings inspired the children's book that our oldest son likes to hear selections from at bedtime: "From I-Ville to You-Ville", written by a Greek Orthodox woman based on her conversations with Elder Paisios of Athos. I showed the icon to our son as we talked about this favorite book. How blessed we are to be in the company, even, unworthily, in the family -- of saints, and above all, of Our Lord and Savior, Jesus Christ! 4) "Why do we do what we do?" I was born into a religious family. Many of my relatives were active in the Evangelical United Brethren (EUB) church, as ministers and as laity. Albert Einstein once said, "What does a fish know about the water in which he swims all his life?" That's pretty much how I viewed religion in my early life; something that was all around, so pervasive that it was a general assumption and not something I really noticed. As I grew older, I became curious about the tenets and practices of my denomination and my faith. "Why do we do the things we do? What do the various actions represent? What makes this church, this denomination, different from other Christian faiths?" These questions should have been rather easy to answer, I thought. But it seemed they weren't. At least, the answers seemed to be different depending on who was asked. I eventually realized that the deeper answer was usually, "because we've always done it that way" or "because we like to do it that way." Those answers didn't tell me what I needed to hear. The EUB church eventually merged with the Methodist church in 1967. It had a very diverse group of congregants, from people who were very evangelical (with tent meetings and such) to people who were very "mainstream" (liberal theology, social gospel, etc.). I kept wondering what were the beliefs that really united us as a denomination? To try to get answers to this, I proposed to the adult Sunday school class I was in that we spend a season reading and discussing our church's doctrine so we could all know what beliefs our church actually professed. No one else seemed all that interested in doing this. I took this to mean that church doctrine wasn't all that meaningful or important to discuss, at least to the vast majority of its members. I gradually drifted away from regular church attendance, as it didn't seem to hold much beyond the regular motivational and inspirational stuff I'd heard and been exposed to all my life. In 1989, I began dating a Greek woman, and started attending Holy Cross Orthodox Church with her and her children. This was my first exposure to and experience with Orthodoxy. It was very different from anything I'd ever seen before! I was naturally curious. Imagine my surprise when I asked what, for me, were standard, usually-unsatisfactorily- answered questions like "Why do you have a wall between the congregation and the altar?" I got serious, understandable answers based on the Bible, history, and theology! In the Orthodox Church, there were reasons for the things that were done! And all the reasons were at base directed toward one end: the worship of God, Father, Son and Holy Spirit. "Why do we sing hymns?" Not because we enjoy the music but because they help us understand and get into the proper frame of mind for worship. Everything in the liturgy had a meaningful purpose; a task to perform in furtherance of divine worship "in spirit and in truth." I realized that there would never be an Orthodox folk liturgy, or jazz liturgy, or any of the "trendy" worship distractions that most other churches sometimes use to try to attract people. No, worship isn't supposed to be entertainment, it's supposed to be worship. That's what I'd found in Orthodoxy! I certainly wasn't an instant convert to Orthodoxy, as Father Dan will attest. I kept coming to church for some years, kept asking questions about Orthodox faith and practice until, finally, I felt that I was ready to truly and honestly accept and embrace Orthodoxy. Luckily for me, Father Dan eventually agreed. I was formally received into the Orthodox faith and joined Holy Cross as a member -- and they've been stuck with me ever since! 5) "From Russia, with Love"
My journey to Orthodoxy began about 12 years ago in St Petersburg, Russia. My wife and I were there in the process of adopting two children when I toured the ancient Orthodox cathedral of St Isaac's. I was impressed and gazed in awe at all the icons of Jesus Christ, His Mother and the saints. While there, I also noticed a group of Russian soldiers touring the church. "What was this!? I thought Russia was a godless, atheist, communist country?" There was also an icon in the apartment where we stayed. It seemed to become for me a "window into Orthodoxy:" the ancient faith of the Russian people. My religious background was with various Protestant denominations; from Baptist to Church of Christ to Presbyterian. I was completely oblivious to the Orthodox Church. Church history never seemed important in any church I ever attended. (They normally traced their "history" back only as far as the Reformation!) The thought of this historical "lapse" subsequently lingered with me. Some three years later, my personal life turned upside down. I endured a painful divorce, the loss of my home and my business. Turning to my church at the time, I found little comfort or consolation and my faith began to falter. Soon after, I returned to Russia for a tour. The tour guide was herself a convert to Orthodoxy. Our conversations again stirred my curiosity and renewed my earlier experiences and questions regarding the Orthodox Church and church history in general. 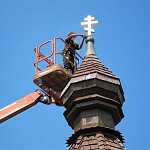 I learned that with the fall of communism in 1991, a lot of Russians had returned to their ancient roots in the Orthodox faith; that old church buildings were being restored as functioning churches with regular services, and that the new Russian government was now actually encouraging the teaching of Christianity as it helped develop better citizens. In Moscow's Kremlin, the heart of the "evil empire," there were at least four churches and a museum I visited with centuries-old bibles, icons and artifacts. I was seeing a religious faith and a Church that was still alive, after a thousand years and severe persecution! This all piqued my curiosity and incited further study. When I moved to Williamsport in 2000 -- my faith, somewhat restored -- I returned to my Protestant upbringing and visited churches of various denominations. I enjoyed the music and the people but became increasingly disillusioned in the lack of any substance to the faith professed. "Where was their sense of history, of the early Church, of apostolic doctrine?" Something seemed terribly missing. My heart kept taking me back to Russia -- and to the Orthodox Church! I began to read and study anything I could get my hands on. I discovered that the Orthodox Church dates back to the first century, with a line of apostolic succession to the present; that the areas where the apostles preached are largely still Orthodox to this day; that the Protestant Reformation was a reaction not to the Orthodox Church but the Roman Catholic Church; that the Orthodox Church is a living continuity with the Church revealed in the Bible, with liturgical worship, sacraments, spiritual discipline and direction appropriate to today! In light of these discoveries, I asked myself; "If that apostolic church still exists, why am I not a part of it -- why am I not Orthodox?" While still attending a Protestant church, I conversed with people about my travels to Russia. 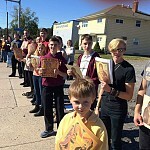 In the midst of one such conversation, I was informed of (and surprised to hear about) the presence of an Orthodox church in Williamsport -- made out of old logs and selling perogi. A Greek friend who belonged to that church personally invited me to come. I remember driving into the Holy Cross parking lot for the first time and just staring at the church. It looked like some of the churches I'd seen in Russia. I think I did this three times before I finally mustered the courage to actually attend a service. One Sunday morning, I woke up and said to myself; "Today's the day. I'm going to go into that church." It seemed when I opened the large, wooden doors to the church, I was opening a new chapter in my life. It was something else: like heaven on earth. The candles, the icons, the incense, the worship, the standing and chanting were spiritually overwhelming. "God," I thought, "is truly present here!" I stayed for coffee hour and the people were all very welcoming, though they didn't know me from Adam. As I returned the following Sunday, my heart knew I was home. Those born into Orthodox households or who, like me, have converted to Orthodoxy have been given a great gift from God. It is the gift of new and abundant life in Jesus Christ and His Body, the Church -- a beautiful, loving, eternal family! This is where I truly belong, now and forever. 6) "The never-changing faith in the ever-changing world"
My journey to Orthodoxy began at a young age. I was greatly influenced by my grandmother who would watch us from time to time and sing songs like "Rock of Ages" and "My Cup is Full and Overflowing." We attended the local Methodist Church every Sunday, and we always attended as a family. I continued to attend the Methodist Church until 1993 when I married Hayln. We started to attend the Baptist church she had been attending. In the spring of 1994, shortly after I graduated, we moved. And over the next ten years, we attended many different protestant churches; Baptist, Christian and Missionary Alliance, Church of God, and Brethren in Christ. In January, 2001, Hayln and I moved back to Jersey Shore and we started attending the Jersey Shore Church of God. This church was full of energy and would really get you thinking that you were in the right church. They had a worship leader and a band. After a short time, Hayln felt something was missing -- and she was right. The more we paid attention, the more we realized that we weren't really there to worship God. We were there because we were having a good time. It wasn't about God; it was more about us being entertained. During this same time, my mother-in-law was attending a small church (Holy Cross!) that was similar to the one her father had attended when he was a child. She never said much and wasn't pushy at all. I just remember her saying, "It just feels like I have finally come home." After leaving the Church of God, Hayln and I sought out a smaller church that we felt was more reverent, also trying to avoid the feeling that the church we were attending was making a greater effort to keep us entertained than to help us in our spiritual growth. At some point, Hayln started to attend the Monday bible studies with her mother and developed a great urge to attend Holy Cross Orthodox Church. Easter and Pascha were coming soon and they were not on the same weekend, so Hayln asked if we could attend both. I agreed. "Why not celebrate with both my parents and her mom?" Later, Hayln informed me that the service started at 11:00 PM! I didn't find out until I was AT the service that it lasted three hours and I would have to hold my son the whole time! This didn't help to develop a good attitude toward the Orthodox Church! Besides that, it felt to me like the Roman Catholic Church and I didn't want my family to attend this type of church. Hayln, however, was determined that she would attend no other church, and, for a short time, she and I attended different churches. This went against my childhood feeling that church was a family event and it didn't help that most Sundays I went to church angry and Hayln went to Holy Cross crying. One Sunday, I had our son Ethan along with me and it was a particularly rough morning. I thought; "This is not how God intended church to be. We should be together as a family." So I made up my mind that I would attend the Orthodox Church with Hayln -- until I was able to find some theological error! Then we could leave the Orthodox church. The first few weeks at Holy Cross I spent looking at the architecture and then sneaking out to the creek with Ethan halfway through the service. 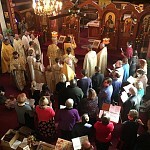 But eventually, I began paying attention to the Liturgy (since that was the only way I was going to find any "errors!") I had many questions. I asked Father Dan all of my questions as I felt he would be honest and I could easily show the errors to Hayln, and then we could quietly move on. What happened was the opposite. Father Dan answered all of my questions, with references from the Bible. In the Orthodox Church, the interpretation of a verse must be supported by all of the verses around it or it is simply taken out of context. So the answers were actually more thorough and true than I would have received from a protestant pastor. Hayln and I started to attend inquirers classes, and we had many discussions with Father Dan. As Pascha was (again) approaching, Hayln seriously wanted to join the Orthodox Church. I, too, was receptive to the idea. Father Dan addressed all of my concerns to that point and I was beginning to feel that there was more to this church than the other churches that I attended. So one night during an inquirers' class, I approached Father Dan about joining the church. Much to my surprise, Father Dan said "Let's wait. I'm not sure you're quite ready yet." I believe he was right. Hayln was ready: she'd been ready for a year! I, on the other hand, realizing that joining the Orthodox Church was equivalent to a marriage, was not quite as ready to make that commitment. On September 17, 2005 our family was received into the membership of Holy Cross Church. I will never forget the first time I received the Holy Eucharist. It had been several years since we had been able to take communion. Communion was always something that both Hayln and I held special, even as Protestants when we believed it to be symbolic. We both longed to receive the Eucharist, and when we approached the chalice to receive the Body and Blood of Christ, I was taken by surprise when I noticed the Chalice appeared to be steaming like a hot cup of tea on a cold morning. My first thought was "this could be hot enough to burn!" But when I received the Eucharist, it was not overly warm. My family has been part of the Holy Cross family now for two years. We have recently found that when we occasionally attend non-orthodox churches for special events, the services are lacking. There is truly a blessing in worshipping the Holy Trinity with all of your senses; from the icons and incense to receiving the Eucharist. Not only does all this help to keep one's focus DURING the service but the incense lingers as you leave the church. It all helps us remember the never-changing faith, in the ever-changing world!